How long can fires burn? It was declared a “public nuisance” but after burning for almost seven months the compost fire in Beenham, Berkshire, was finally extinguished. 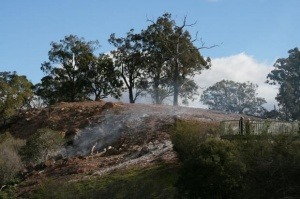 The blaze at the abandoned Good2Grow recycling centre started on 30 November 2012 and was put out on 21 June 2013. In Hertfordshire, fire crews were on site for 15 days in Hemel Hempstead when a “deep-seated fire” burned in a large pile of recycled timber in November 2012. In New Straitsville the fire developed a tourist feature. In the 1930s, the government intervened as the fire was beginning to spread to parts of the town. Residents were evacuated and homes demolished. In the 1970s one of the highways had to be moved because it kept sinking. But that is no match for the world record for the longest-burning fire which is believed to have started around 5,000 years ago at a coal seam beneath Mount Wingen in New South Wales, Australia, and is still smouldering. So… How long can fires burn? How long is a piece of string?